with a public official whose personal interests conflict with his/her professional position. with a person who has conflicting responsibilities. Nepotism is the practice of giving favors to relatives and close friends, often by hiring them. Self-dealing is a situation in which someone in a position of responsibility in an organization has outside conflicting interests and acts in their own interest rather than the interest of the organization. These activities in themselves create the conditions for a conflict of interest, but not wrongdoing or criminal activity. For example, a business executive hiring her daughter might not be a conflict of interest unless the daughter is given preferential treatment, like giving her a salary higher than others in her pay level. If the executive isn't in a position to give favors, there's not a conflict of interest. In the private (non-governmental) sector, most organizations have policies and procedures that don't allow a conflict of interest, to avoid a potential problem before it occurs. For example, in the situation above, many businesses have policies against hiring relatives in certain situations. Like other types of illegal or unethical activities, conflict of interest activities carry the risk of consequences. Public Sector. Federal and state laws have been set up to criminalize conflicts of interest in the public sector (government entities). In certain circumstances, conflict of interest can result in prosecution. 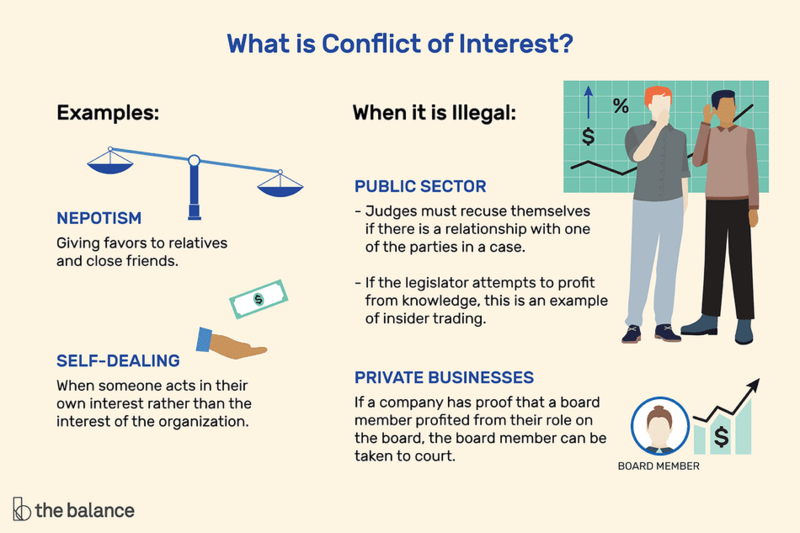 For example, public officials, like state legislators, are specifically prohibited from activities that would result in a personal gain because of conflict of interest. Private Businesses. In most cases in private business situations, conflict of interest matters are handled in court by a civil lawsuit. For example, if a company has proof that a board member profited from her role on the board, the board member has violated her duty of loyalty and can be taken to court. An employee may work for one company but he or she may have a side business that competes with the employer. In this case, the employee would likely be asked to resign or be fired. A common workplace conflict of interest involves a manager and his or her employee who are married or dating and have a relationship. This is a conflict because the manager has the power to give raises or promotions to the employee. Discussions about the company between the two people may also breach confidentiality restrictions. An employee who has a friendship with a supplier and allows that supplier to go around the bidding process or gives the supplier the bid. A former employee may take his former company's customer list and directly compete. Non-compete agreements are often required of executives and business owners for this reason. Members of a corporate board of directors sign conflict of interest policy statements. If a board member has a conflict of interest, he could be kicked off the board and possibly sued. For example, if a board member has a sexual relationship with an employee, or if he is taking business away from the company and giving it to others. A common conflict occurs when a board member hears of a potential deal that might affect the selling price of company stock (up or down). The board member's attempt to profit from this knowledge is called insider trading; it's illegal as well as being a conflict of interest. Non-profit boards have the same issues. In fact, the IRS requires that non-profits to disclose potential conflicts of interest. Judges must recuse themselves (take themselves off a case) if there is a conflict of interest. For example, if the judge has a financial relationship with one of the parties in a case, she must disclose that relationship immediately and recuse herself from the case. Any public servant, in the federal, state, or local government, may have a conflict of interest based on their knowledge of events. If the legislator attempts to profit from knowledge, this is another example of insider trading. Attorneys are bound by the Code of Professional Responsibility of the American Bar Association. One common example of conflict of interest by an attorney is if the attorney tries to represent both parties in a case (like a divorce). Physicians have the same types of conflicts of interest as attorneys. For example, physicians should not be handling financial matters for patients and should avoid improprieties with patients and staff. Journalists and reporters can get into ethical trouble by publicly endorsing a political client or cause, or by getting too close to a source or becoming too friendly with the subject of a story. To avoid conflicts of interest, it's most important to avoid the appearance of a conflict.